Dr. Ajay Khera, Deputy Commissioner from the Ministry of Health and Family Welfare along with global mental health expert and one of Time 100’s most influential people, Prof. Vikram Patel launched a novel parent mediated program for autism for India’s leading mental health NGO, Sangath in New Delhi on Saturday morning a the India Habitat Center. The NGO hosted an open panel discussion and short film screening with eminent leaders in the field of autism and mental health from India and the UK. 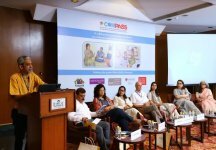 The project, called COMPASS (Communication centered Parent mediated intervention for Autism Spectrum Disorders in South Asia), is a collaboration between an impressive list of institutions including University of Manchester, Havard Medical School, Sangath, Maulana Azad Medical College and associated Lok Nayak Hospital, AIIMS, National Health Systems Resource Centre and Kings College London. COMPASS will train ASHA workers (government community health workers) to visit families in their own homes, to deliver the program under the supervision of the NGO’s health staff. Autism is a developmental disorder, which causes social communication difficulties and impacts one in a 100 children. India will have more than 2 million children with autism under the age of 10 years. Most services in India are currently based in urban centers and delivered by specialists, which means that most families have no access to help for their children. In COMPASS the team will train ASHA workers in community settings such as the homes of families. This effort is aimed at addressing the challenges of families who currently visit MAMC and AIIMS for services but find it difficult to manage the frequent travel to avail of centre based services. The Parent mediated intervention for Autism Spectrum Disorders for South Asia Plus (PASS Plus), which will be evaluated has already been field tested in Goa and Kolhapur in Maharashtra. This work will provide the first trial evidence to inform the ambitious plans of the Government of India to scale up community based interventions for ASD through programs such as the Rashtriya Bal Swasthya Karykram. Sangath, established in 1997 (www.sangath.in); is now one of India’s leading community based health research NGOs whose work has been cited as having led to "innovative research of relevance to public health in developing countries” and as one of the leading examples of academic psychiatry in the global context. Sangath was awarded the prestigious MacArthur Foundation International Prize for Creative & Effective Institutions in 2008. Starting out 20 years ago as Goa’s first multi-disciplinary child development clinic, Sangath has now conducting work across India with a view to developing packages of care for community delivery for a range of mental health conditions. It has been the state nodal agency for the Government of India’s national health program, the National Trust for the Welfare of Persons with Autism, Mental Retardation, Cerebral Palsy and Multiple Disabilities. Western Digital 1TB microSD card be available now Accordingly Western Digital and Micron have announced UHS-I microSD cards with 1TB storage capacity at MWC 2019 to meet the demand of professionals for higher storage space. Micron's storage solution goes by the name Micron c200 1TB microSDXC UHS-I and will be available in the second quarter of 2019.